John H. Durham, United States Attorney for the District of Connecticut, Patricia M. Ferrick, Special Agent in Charge of the New Haven Division of the Federal Bureau of Investigation, and Kristina O’Connell, Special Agent in Charge of IRS Criminal Investigation in New England, announced that a federal grand jury in New Haven returned an indictment today charging OLUKAYODE IBRAHIM LAWAL, 35, a citizen of Nigeria residing in Smyrna, Georgia, with fraud and identity theft offenses stemming from a scheme to obtain the personal identifying information of school employees in Connecticut and elsewhere. On May 9, 2018, LAWAL was arrested on a federal criminal complaint at his residence. He appeared before a U.S. magistrate judge in Atlanta and was ordered detained pending his transfer to the District of Connecticut. 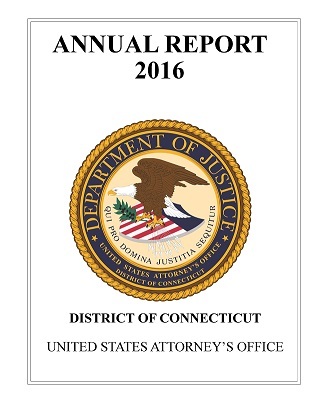 As alleged in the charging documents, special agents from the FBI’s cybercrime squad in New Haven and the IRS have been investigating “phishing” emails that were sent to various school districts in Connecticut last year. In March 2017, an employee of the Groton Public Schools received an email that appeared to be sent by another Groton school system employee. The email contained a request to send W-2 tax information for all employees of the school system. The recipient of the email responded by sending copies of the W-2 information for approximately 1,300 Groton Public Schools employees. After the W-2 information was emailed, approximately 100 suspicious Forms 1040 were filed electronically with the IRS in the names of victims of the Groton phishing scheme. The 100 tax returns claimed tax refunds totaling $491,737. Approximately three of the returns were processed, and $23,543 in fraudulently-obtained funds were electronically deposited into various bank accounts. It is alleged that LAWAL controlled or used certain email accounts involved in this phishing scheme, and that he participated in the scheme to obtain the Groton school system employees’ personal identifying information and use it for personal gain. The indictment charges LAWAL with one count of conspiracy to commit wire fraud and one count of wire fraud, offenses that carry a maximum term of imprisonment of 20 years. The indictment also charges LAWAL with one count of aggravated identity theft, an offense that carries a mandatory consecutive term of imprisonment of at least two years. It is alleged that LAWAL entered the U.S. on a visitor’s visa on November 24, 2016, and failed to depart on his scheduled departure date of December 1, 2016. This matter is being investigated by the Federal Bureau of Investigation and the Internal Revenue Service, Criminal Investigation Division. The case is being prosecuted by Assistant U.S. Attorneys Sarala V. Nagala and Stephen B. Reynolds.